A folk-themed gift? Why not? There is no greater pleasure than to give presents to the ones you love. Their happiness makes up for all strife and problems of everyday life, and their thanks make our hearts beat a little bit faster. Express your feelings with a unique present that would make the recipient feel special. A gift can also be functional. A beautiful bunch of flowers or a box of chocolates is nice, but sometimes we need something more, something that would stay with our loved ones for years. 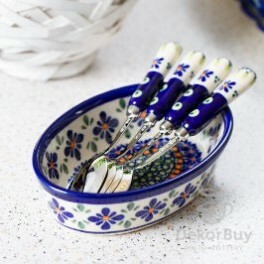 Such a gift could be Bolesławiec pottery from DekorBuy! We offer you 100% hand-made products which are highly durable and beautifully painted in folk style. Folk is in fashion, therefore we believe that with our vast choice of plates, cups and spoons you will find a perfect gift for your family and friends. Check out our products!